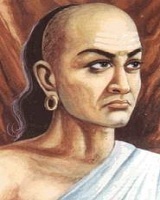 Chanakya 371 BC 283 BC Indian Rishi Canak Author, Philosopher, Teacher, Adviser An Indian teacher, philosopher, economist, jurist and royal advisor. He is traditionally identified as Kauṭilya or Vishnu Gupta, who authored the ancient Indian political treatise, The Arthashastra. A list of popular chanakya quotes are given below.